Happy Friday! Last weekend, I had a little extra time in my craft room and couldn't resist creating another card with the adorable deer image in Papertrey Ink's FAWN & FLORA set. Instead of the usual fawn color, I decided to stamp the deer in grays. Love the lighter look! This is SOFT STONE and WEATHERVANE. 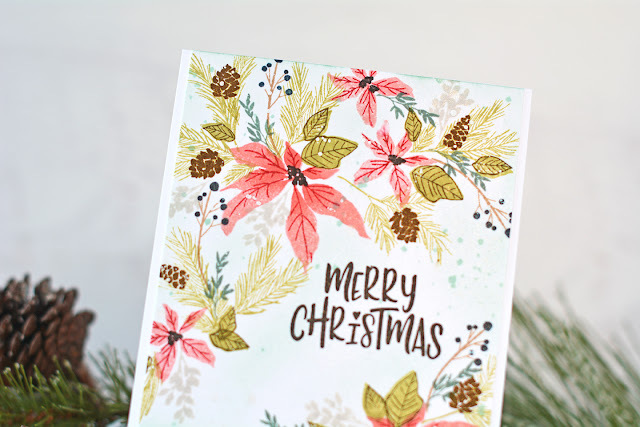 The sentiment is stamped on vellum in a light red pigment ink, then heat embossed with clear powder. 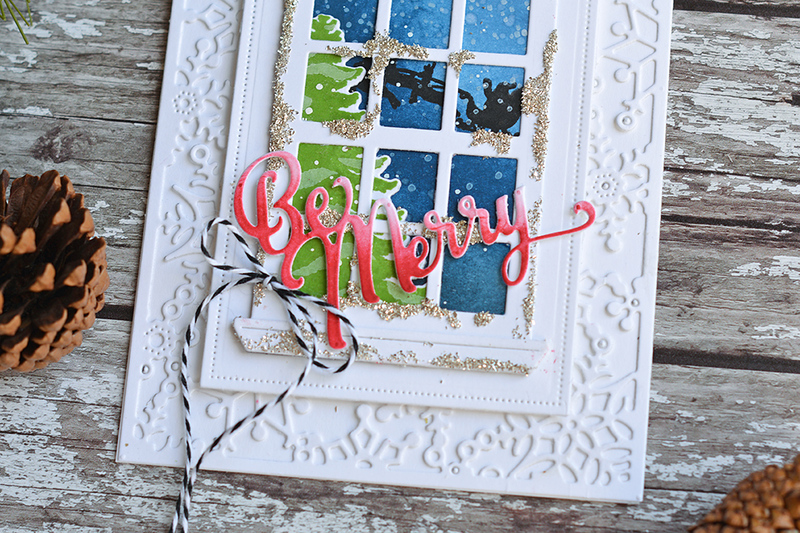 I ink blended and splattered a BOLD BORDERS: YULETIDE die-cut to use as a frame. 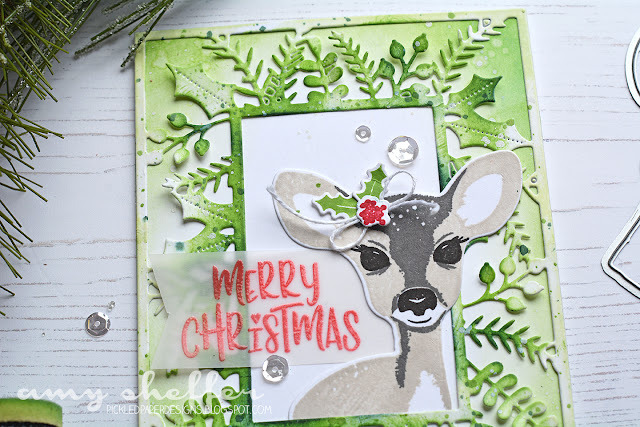 I also ink-blended and splattered around the perimeter of the white card base for a softer, tone-on-tone look with the BOLD BORDERS: YULETIDE frame. So glad you stopped by! Have a great weekend! Supplies are displayed and linked below. Where available, I have used affiliate links. If you make a purchase through these links, I receive a small commission at no extra cost to you. I appreciate your support! Just wanted to pop in today and share a card I made for Reverse Confetti's September release, but forgot to share here. These little Halloween cuties are from FRIGHTENING FRIENDS, and the sentiment is from BOO YEA. In the background is a TRIANGLES COVER PANEL diecut in Premier Polar White card stock. The pattern paper strips are from the ABUNDANT AUTUMN paper pad. It will be hard to put this set away at the end of the month! These guys are so cute! Papertrey Ink's October release is now available in the Papertrey Ink store! 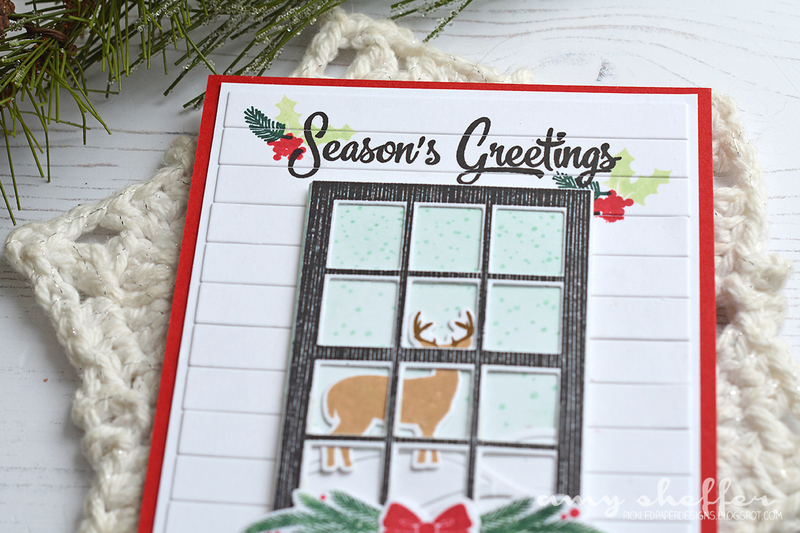 I have a few more cards to share, starting with this shiplap WINTER WINDOW scene. 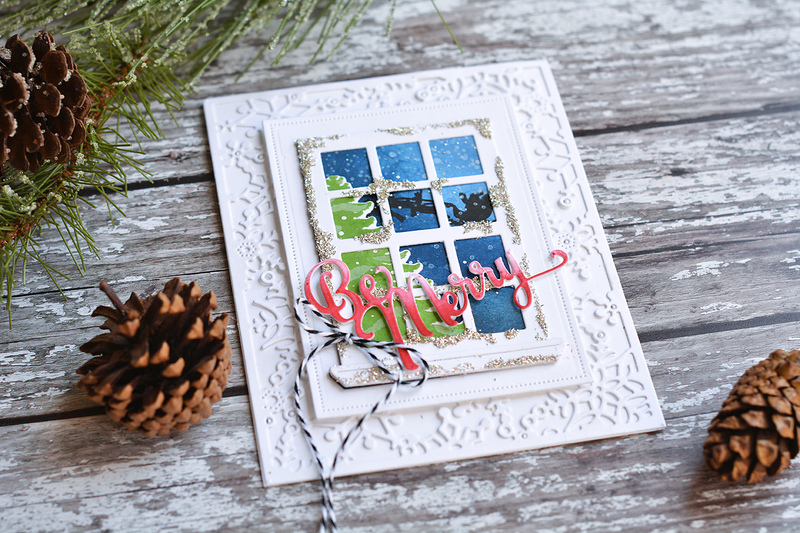 The shiplap look is super easy if you have any type of striped cover plate die. I used Papertrey's HORIZONTAL STRIPES COVER PLATE here. Of course you could always use a paper trimmer to cut the strips, but I think the die-cut strips have a more finished look. I (like many) love the modern farmhouse look, especially houses with white shiplap and black windows, so that's what I've created here. 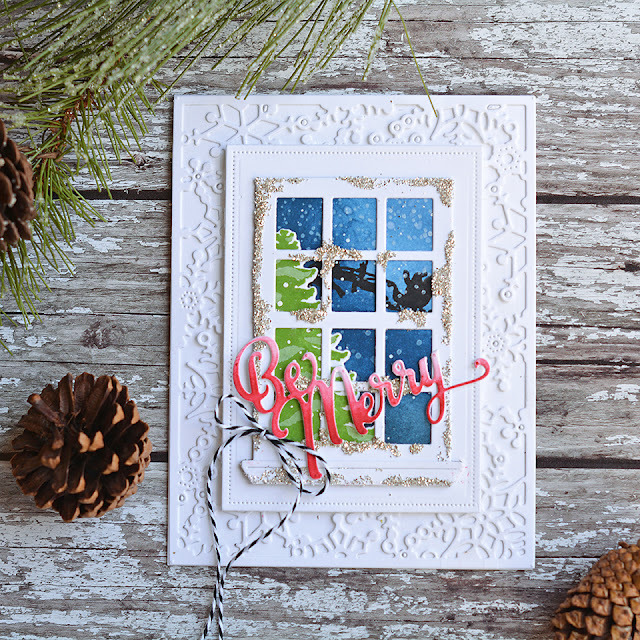 Behind the window, I put together a winter scene using mostly the images and dies from the WINTER WINDOW collection. The only addition I made was the snowy hills landscape, which I did with the SHAPE SHIFTERS: OVAL 2 die. 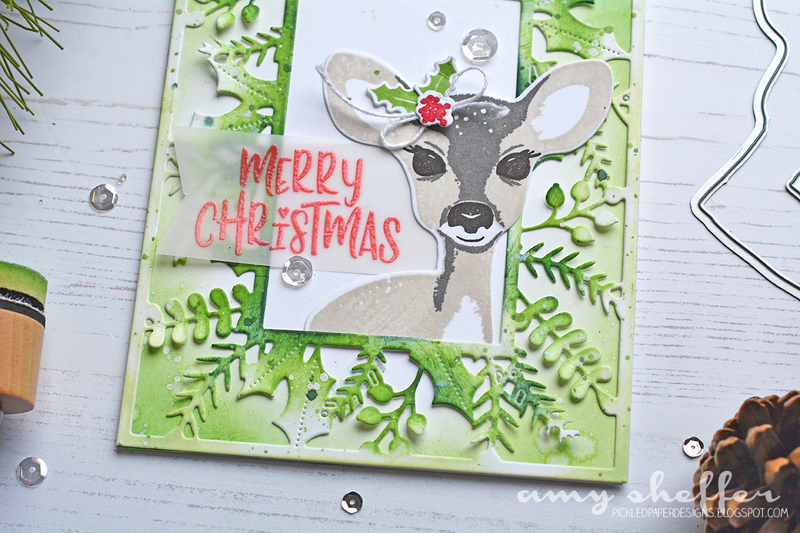 I stamped the sentiment along the top, using a MISTI to stamp multiple times for good coverage over the horizontal strips. The tiny holly and pine images are from FAWN & FLORA. It's Day Four of Papertrey Ink's October Release countdown. Welcome! I'm excited to help introduce WINTER WINDOW stamps and dies today. You can find all the details about these new products HERE. The October Release products will be available at 10 pm October 15 in the Papertrey Ink store. 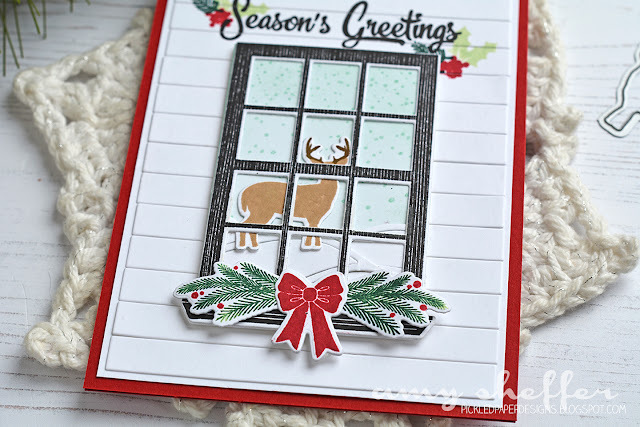 WINTER WINDOW stamps and dies by Lizzie Jones contain all sorts of different dies and images to create winter and Christmas window scenes: falling snow, a tree, deer, holiday swag, candle, etc. 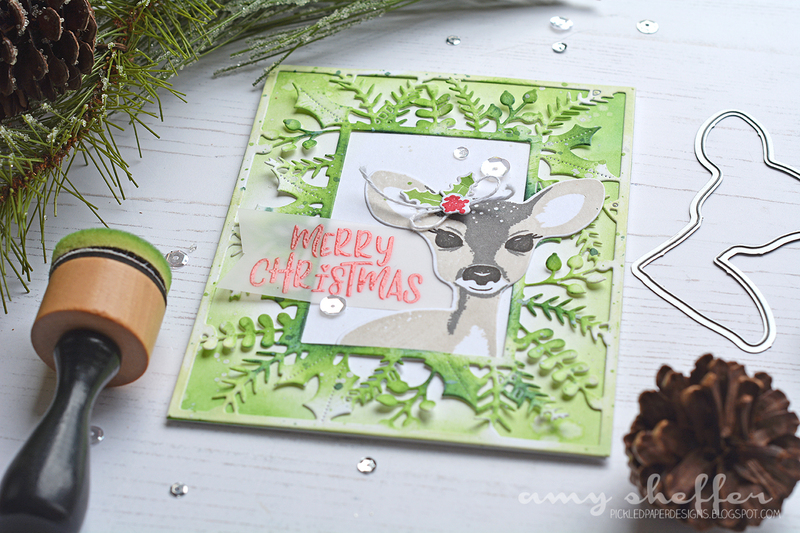 The sentiment diecut is from last month's BOLD BORDERS: YULETIDE, and my snowflake backdrop was done with this month's BOLD BORDERS: FLURRIES. I really wanted to make a shiplap background around the window, but it wasn't turning out quite like I envisioned, so that may come another day. 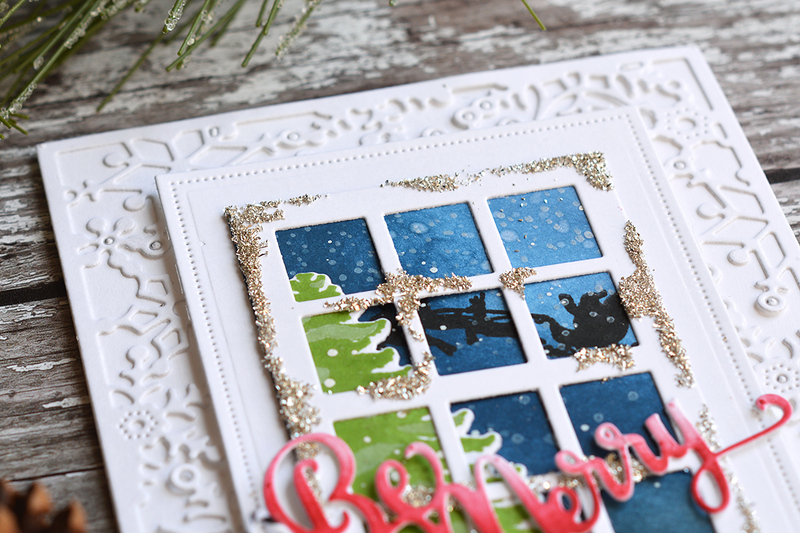 I thought the card needed a little sparkle, so I added some silver glass glitter to the window perimeter. It's quite sparkly in real life, and breaks up all the white in the background. 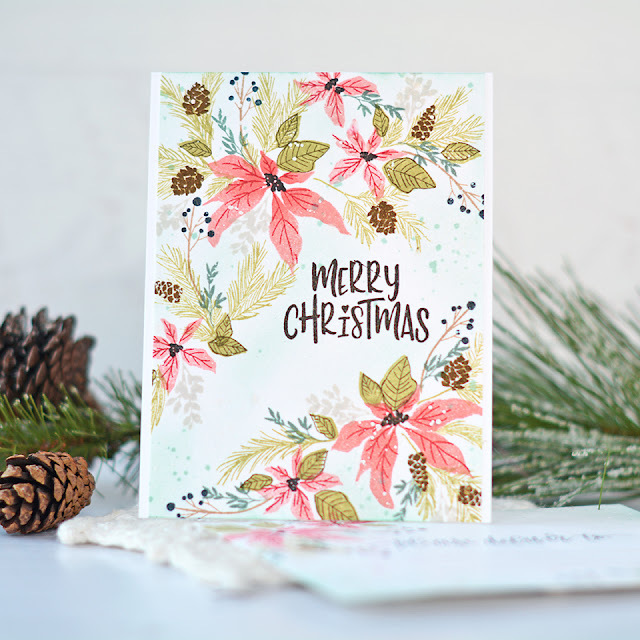 For lots more inspiration and new product details, visit the Papertrey Ink blog. Hello and welcome to Day One of Papertrey Ink's October Release countdown! 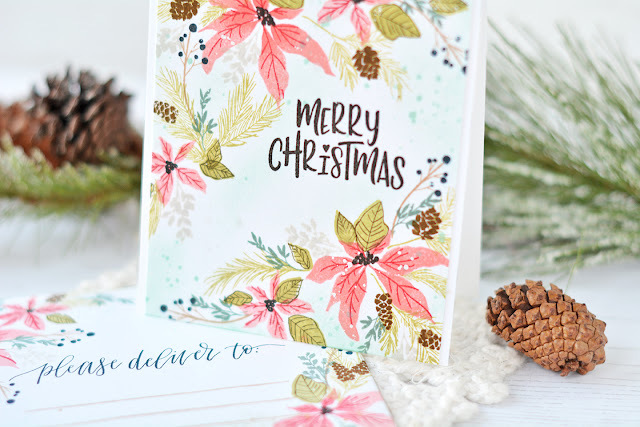 Today I will be helping to introduce two new sets: PLEASING ENVELOPES and FAWN & FLORA. 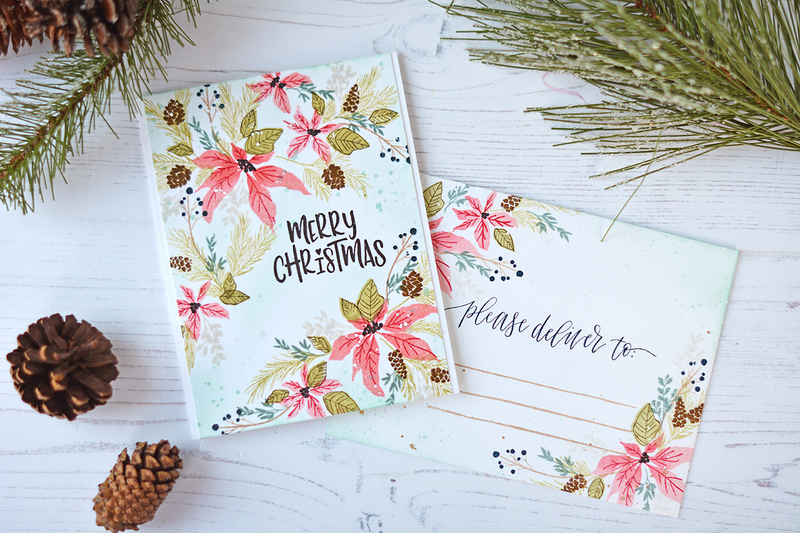 First up is PLEASING ENVELOPES by Jennifer Campbell, which is a set filled with beautiful winter florals, including two poinsettias, and sentiments appropriate for envelope art and tags. I loved stamping and layering these images to make a card and coordinating envelope. For my background, I stamped the poinsettias in Pale Peony, added some shading with Berry Sorbet and the veins in Pure Poppy. The evergreen sprigs are stamped in Spring Moss, the leaves are in Spring Moss and Olive Twist, and the pinecones are Cocoa Bean. For more filler images, I added some different sprigs in Ocean Tides, Soft Stone, Classic Kraft and Dark Indigo. 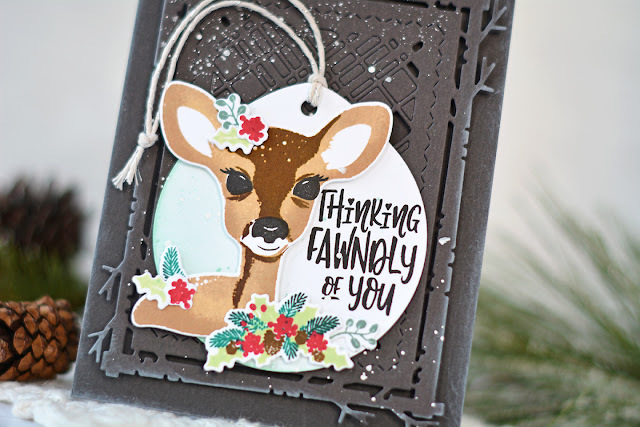 The Merry Christmas sentiment is from FAWN & FLORA. For added interest, I ink blended around the stamping in Aqua Mist, then splattered with Aqua Mist and opaque white. One final touch was to spritz the whole panel with some shimmer spray. I stamped the coordinating envelope in the same way. 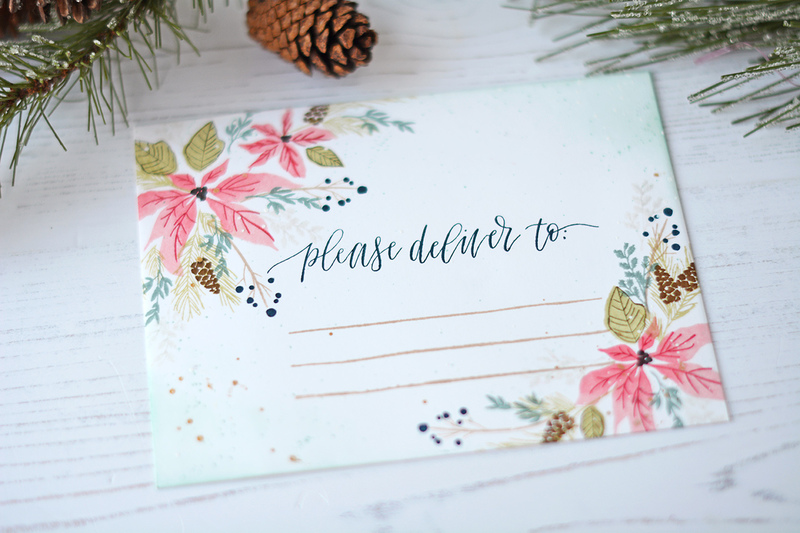 Who wouldn't love to receive a colorful envelope stamped with these beautiful florals?! Next up is a really sweet set designed by Betsy Veldman: FAWN & FLORA. The various multi-step images are quick to stamp and easy to line up. In addition to the holiday greens, there are some other florals too, making this set much more than a holiday set. 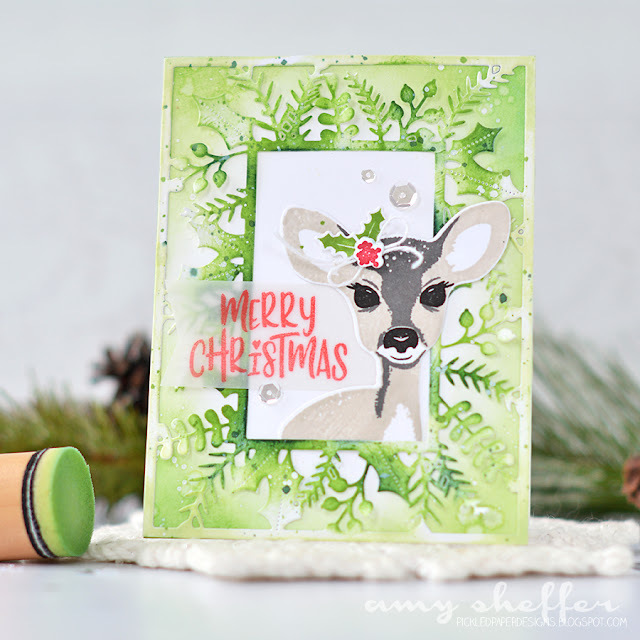 I stamped my deer in Classic Kraft, Cocoa Bean, and True Black, then added some Christmas greens stamped in Mint Julep, Tropical Teal, Pinefeather, Cocoa Bean, Pure Poppy, and Ocean Tides. 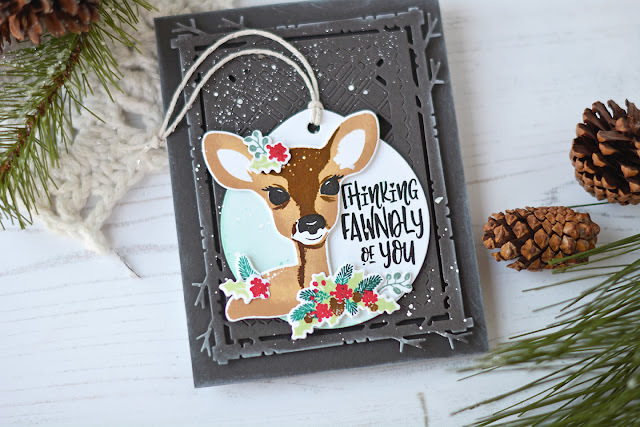 I stamped a sentiment onto a BASIC CUT TAG diecut, ink blended in Aqua Mist and spritzed with opaque white. 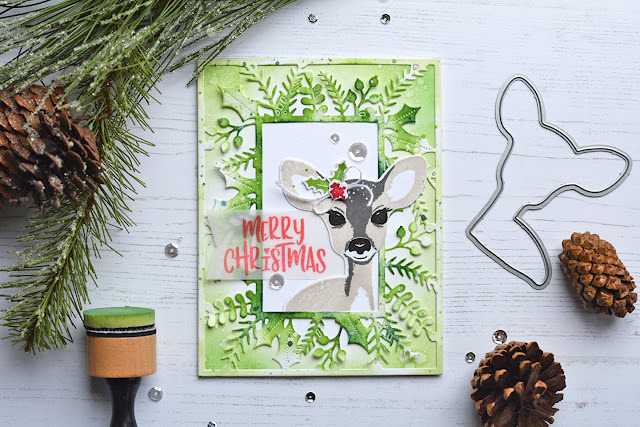 In the background is a Smokey Shadow MIX & MAT: PLAID diecut with some opaque white spritzing and some slight Fresh Snow blending around the perimeter.